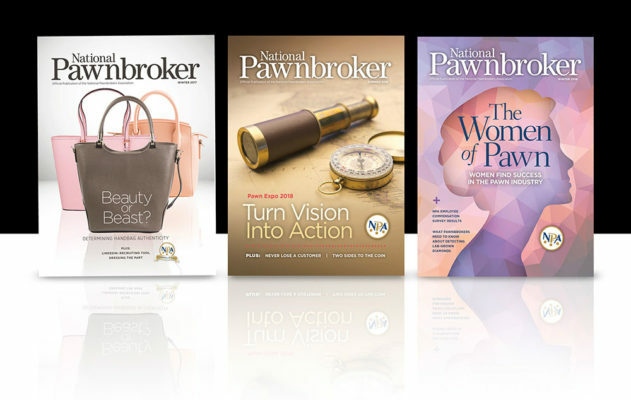 National Pawnbroker is the official member publication of the National Pawnbrokers Association. It is published quarterly in March, June, September, and December each year. The magazine shares timely articles to assist in the success of a pawn business. Covered topics include legislative issues, industry news, human resource and employment, compliance, and much more. To view past issues, visit www.ISSUU.com and search for National Pawnbroker. NPA Insider is the NPA’s monthly member e-newsletter. It contains membership updates, member news, and other timely information you need to stay up-to-date on association activities and events. Since pawnbrokers are in the media spotlight more and more every day, Pawn PR 101 will give you a few public relations “tools” to use successfully in future media interviews. Pawn PR 101 is a quick-reference Public Relations Guide for the pawn industry for you and your staff to conduct a media interview.